A sustained-release form of one of the body's most important antioxidant and detoxification factors. Glutathione-SR is a sustained-release form of glutathione that provides antioxidant support for the liver, brain, heart, lung, and eyes. It also helps the body respond to physical activity. 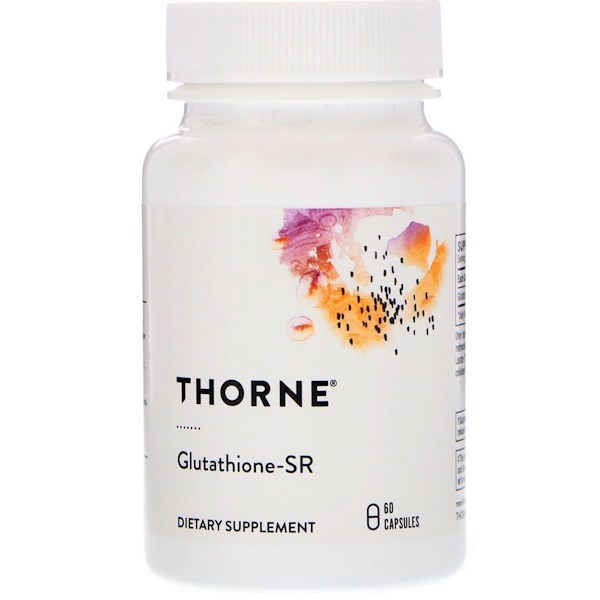 Thorne's Glutathione is NSF Certified for Sport. It occurs naturally in cells and is a cofactor in dozens of enzymatic reactions involved in detoxification. As an antioxidant, glutathione directly quenches several reactive oxygen species (free radicals). *The body's benefits from maintaining a normal level of glutathione include support for liver function, pulmonary function, immune function, bowel health, carbohydrate metabolism, cardiovascular health, cognitive health, and eye health. Glutathione-SR is a breakthrough in glutathione supplementation because its sustained-release formula protects it from stomach acid and digestive enzymes, allowing for a slower release and a more steady level in the bloodstream of this essential nutrient. Glutathione is the most abundant anti-oxidant. Since training and competition create more oxidative stress and damage, athletes have a higher need for antioxidants. Exercise longer than 60-90 minutes significantly decreases glutathione levels in the blood, so supplementing is beneficial for endurance and ultra endurance events. The liver is the body's largest reservoir for glutathione. 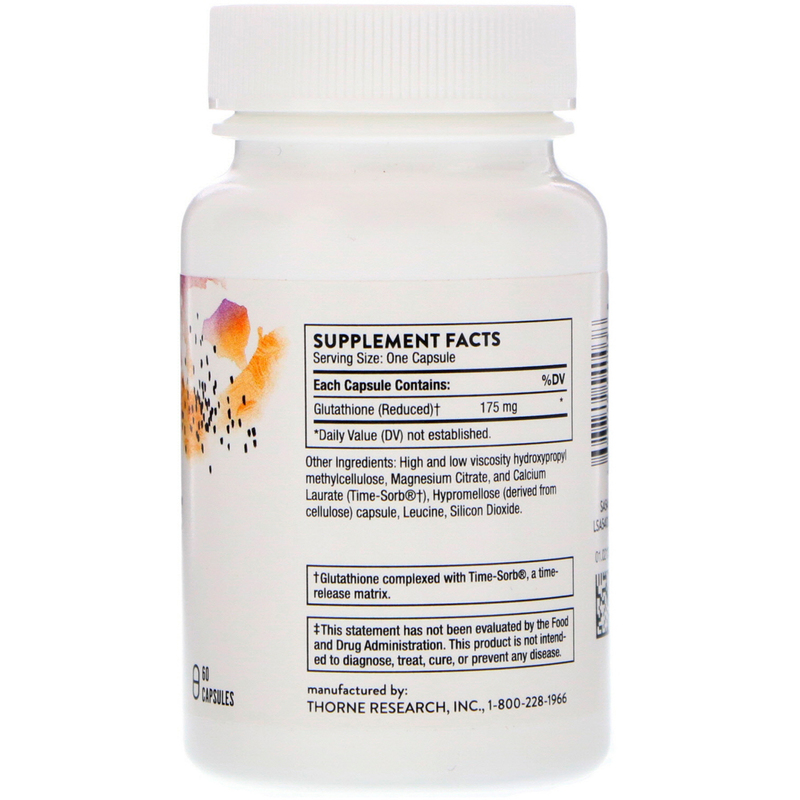 A potent endogenous antioxidant, glutathione is essential for the liver's phase I and phase II detoxification. However, negative lifestyle issues and adverse conditions that affect liver health can result in a decreased amount of glutathione in the liver. Maintaining an optimal level of glutathione appears to be important for supporting cognitive function, especially during aging. The normal process of aging is associated with a decrease in glutathione activity, which can result in increased oxidative activity. Less than an optimum level of glutathione is observed in individuals experiencing a decline in cognitive function. Conversely, individuals who live to 100 tend to have higher glutathione activity. Although a common mistaken belief is that glutathione is not well absorbed when it's taken orally, significant data confirms that glutathione is efficiently absorbed across the intestinal epithelium by a specific uptake system. Because an athlete needs to know that his or her supplements are trustworthy and compliant, every batch of an NSF Certified for Sport product is tested for compliance with label claims and to ensure the absence of more than 200 substances banned by many major athletic organizations, including stimulants, narcotics, steroids, diuretics, beta-2 agents, and masking agents. High and low viscosity, hydroxypropyl methylcellulose, magnesium citrate and calcium laurate (time-sorb†), hypromellose (derived from cellulose) capsule, leucine, silicon dioxide. †Glutathione complex with Time-Sorb, a time-release matrix.